Pointer is a very fundamental and important concept in programming, but a lot of beginner programmers find it difficult to understand pointers. So, in this lesson we’ll try to demystify pointers we will start with basics of pointers. And all you need to know to understand this lesson, is how to write a basic C program, how to declare a variable and how to do simple arithmetic upon those variables. To understand pointers, we first should understand how various data types or various variables are stored in computers memory. 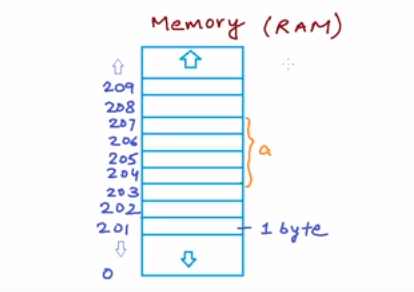 when we talk about computer’s memory in context of program execution, we mostly talk about the random access memory or the RAM. We often say that my machine has got 2 GB or 2 Giga bytes of RAM or 4 Giga bytes of RAM. Now, Let’s say these segments or partitions that we are showing here in the memory is each one byte of memory. then when this program executes, the computer allocates some amount of memory corresponding to this particular varriable. How much memory it allocates, depends upon the datatype and also upon, the compiler. In a typical modern-day compiler an integer is allocated 4 bytes of memory. Character varriable is allocated 1 byte of memory. 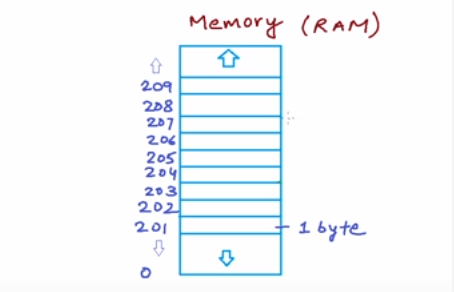 Float is allocated 4 bytes of memory and we can have other variables as well. As soon as the computer sees a declaration, like this, during the program’s execution, it knows that this is an integer variable. so I need to allocate 4 bytes of memory. Let’s say in our example, it allocates memory starting address 204 to address 207 for ‘a’. now once again when the machines sees this declaration it knows that it is a character variable, so it needs 1 byte of memory. So it looks for some free space, let’s say in this case. it allocates the address 209, the byte 209 for ‘c’, and once again it keeps an entry for it, in an internal structure, called lookup table, that ‘c’ is a character, and its address is 209. Now, when you perform some operation with these variables, like let’s say if we initialize a = 5, and our machine or computer sees such a statement, it looks into the lookup table for this variable ‘a’, so it finds this variable ‘a’, that it is an integer and it is at address 204, so it goes at address 204, and in these 4 bytes, starting 204, it writes this value 5.
let’s say we have some statements, and then again after these statements we have another statement which increments ‘a’. Now again, when computer sees that, ‘a’ has to be incremented, it again looks for this address for ‘a’, goes to the address, and modifies this value at this particular address of a. So this block of memory allocated for ‘a’, stores the value 6 now. Let’s say, we have a block of 4 bytes, at address 204 that stores an integer variable ‘a’. Now, we can have another variable, the type of which is pointer to integer and let’s say the name of this variable is ‘p’. Now, this variable ‘p’ can store the address of ‘a’, and using the properties of ‘p’, or using some operators upon ‘p’ we can reach ‘a’. Now ‘p’ also takes some memory so let’s say, it is stored at location address 64 and it also takes 4 bytes of memory. We can also modify ‘p’ to point to another integer. let’s say if we have another integer at address 208 named ‘b’ and having value 10, and if we change the address in ‘p’ from 204 to 208 then ‘p’ now points to ‘b’. means that we have a variable ‘a’ of type int. If we want to write a pointer variable that should point to another variable all we do is, we put an * (asterisk) sign before the variable. So, ‘p’ is now a pointer variable that points to an integer. So ‘p’ is a variable that can store the address of an integer. Now to store the address of ‘a’ in ‘p’ we need to use a statement like p = &a (ampersand ‘a’) now if we put ‘&’ in front of a variable it gives us the address of that particular variable. In-fact, it returns a pointer to that particular variable.